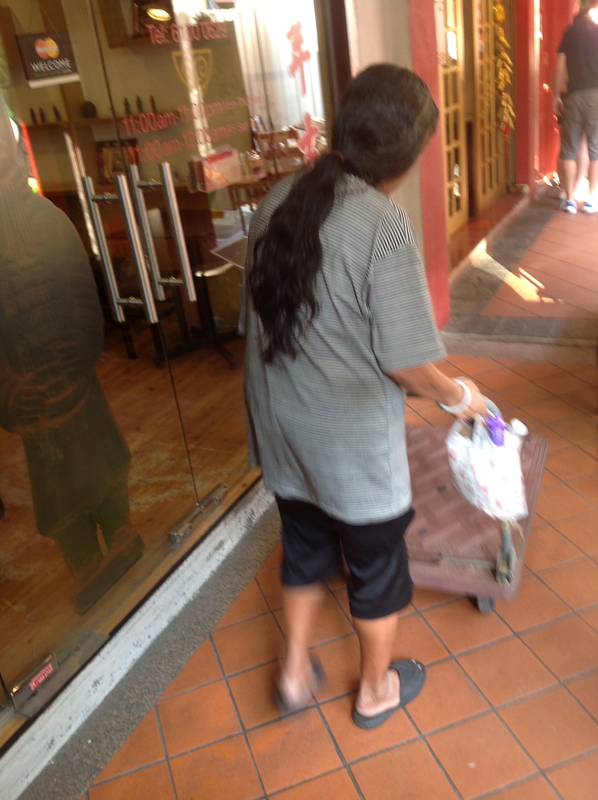 Homeless with a handcart against Singapore’s Grand Prix. This is an update on thee homeless in Singapore case. At about the same time that Sebastian Vettel roared across the finish line at the Singapore Grand Prix on Sunday, Madam L was also crossing the daily finishing line in her own race to collect enough cardboard to survive. She is the one in the lower picture. You can recognise her by the absence of champagne. While the details of the deal between Formula One and the PAP government are not disclosed, the one thing we can be certain of is that the Grand Prix is only possible because it is heavily subsidized with taxpayer funds and GLC monopoly profits. Madam L, who by contrast is a model of self-reliance, only collected $8 yesterday from her six to seven hours of hard work. However we still had a win of sorts on Monday . After our calls to various offices last week two representatives from the Ang Mo Kio Family Service Centre (FSC) came down to our office on Monday afternoon to interview Madam L. (They were accompanied by a young woman from the Thye Hua Kwan Moral Charities) As I only started working on Madam L’s case on Thursday I am pleased by what has been achieved in 5 days. Especially when you consider that Madam L has been living on the streets for over a year now. We should pause for a moment to appreciate our overstretched social workers. Their job is frustrating, often thankless and always poorly paid. They do a commendable job despite the meanness and contradictory ideology of our PAP government. The social workers listened patiently to Madam L. pour out her very real grievances with the manner of her treatment by HDB and other government bureaucracies. Their first response was that it would be a time-consuming process for her to apply for Public Assistance (PA) although I believe that she is undoubtedly entitled to it. Next the social workers cautioned that she could not expect to collect the whole $450 since her children would be required to contribute as well. I pointed out that this was going to be difficult as her son already had three young children to support and Madam L had told us he was not in regular employment and only had work as an odd jobs man to support them. But at least we got the ball rolling. We submitted Madam L.’s NRIC to them and they will make the application on her behalf. We can work on the actual amount later. The representatives from AMK FSC asked what Madam L’s immediate priorities were. I felt that after a year on the street getting a roof over her head came first. Medical care is another priority as she has not seen a doctor in over a year. When she lost all her possessions as a result of her ejection from her flat she had also lost some braces supplied to her after an operation. I asked about the possibility of putting her up in a hostel. They said that was going to be too expensive and suggested she enter a home for the destitute. This is a s 20th century Singaporean version of a Dickensian workhouse. Their idea was that she could stay there while her family circumstances were checked out and start receiving medical care whilst that was happening. Madam L was very adamant that she would not enter a home for the destitute or the elderly. She is also suspicious of charitable hostels. She is after all only 65, doesn’t see herself as fit for the scrap heap and just wants what she feels are her rights. The social workers then said that if she were unwilling to enter the home for the destitute then they would not be able to do anything further till her application for PA was processed. In the meantime they said she should liaise with the young woman from the charity for help although I have to say that with Madam l’s hostility to charities that is unlikely to happen. Clearly the Ministry needs to be able to provide immediate and temporary emergency accommodation in situations like this where the social workers need time to investigate the family background. While we wait for the PA application to work its way through the labyrinth of bureaucracy, our next step is HDB. I want to try to find out exactly why she was evicted and her possessions lost , including her medical equipment and her birth certificate. In fact I have noticed that Madam L gets very agitated on the subject of her birth certificate. It clearly has enormous symbolic importance to her integrity as a person. According to Madam L , HDB said they would arrange alternative accommodation for her by matching her up with another single renter but that was over a year ago and she has heard nothing. Actually that’s a lie. She has heard from HDB. They are vigorously pursuing her for over $5,000 in arrears via letters sent to her son’s address, Charming! The social workers suggested this sum might also include lawyers’ and debt collection fees. I don’t really care where that sum comes from. I find it incredible that they would pursue a homeless person for this and not write it off. After listening to Madam L’s outpouring of the injustices done to her, in which she switched from Hokkien to Malay to Teochew to Cantonese to Mandarin, the social workers hinted that there may have been a problem with hoarding which led to her eviction by HDB. Given that hoarding behaviour often has an emotional or underlying mental health issue , it seems even more incomprehensible that HDB would evict her rather than refer her for treatment. Finally our social workers got up to go , promising to get back to Madam L and us as soon as possible with positive news about her application for PA.
You will recall the woman from the Charity. She was a nice young woman from Hong Kong but Madam L was never going to see herself as a charity case. After all she works for a living. Well the young woman presented Madam L with a large yellow bag from the Goodwood Park Hotel. It contained a packet of cookies and a box of mooncakes. I was struck by the absurdity of giving this poor woman, with all her other pressing needs, a box of mooncakes as though that would somehow solve her problems. I might make that my quote for the week. Homeless and Living on the Streets of China Town update. The people need to speak up for the people. I am greatly impressed by the good work carried out by RP to reach out to the poor and under-privileged. I hardly see such actions from the other political parties and it marks a difference between RP and the rest. I would like to see if I am also help out and contribute my bit to helps those in the lower strata of Sg society. Should there be any opportunity for people like myself, a semi-retired businessman, to participate directly, kindly contact me at my email. Keep up the good work, Kenneth. Thanks for looking out for the poor and homeless. We need people like you in the govt! !